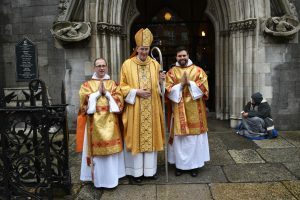 Bishop Denis Nulty with new deacons Brother Matthew Farrell (l) and Brother Jesse Maingot (r) at St Saviour’s Church, Dublin. Pic courtesy of Irish Dominicans. 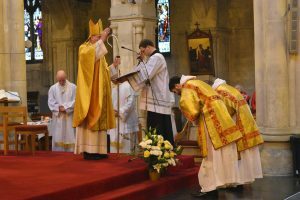 Four men were ordained as deacons in two separate ceremonies on Easter Monday in Dublin, and in Charlestown, Co Mayo. 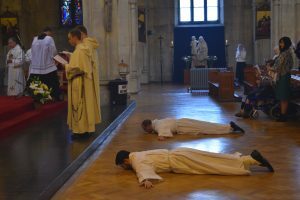 At St Saviour’s Church in Dublin, Bishop Denis Nulty ordained Brother Matthew Farrell and Brother Jesse Maingot, members of the Irish Dominican Province, as transitional deacons. Brother Matthew (43) is a native of Daingean, Co Offaly. He worked in the bar trade for some years before taking up work as a laboratory analyst after gaining a degree in applied chemistry. He comes from a family of three girls and two boys, and both of his parents are deceased. Jesse Maingot (30) is a native of Trinidad and Tobago, West Indies. He entered the Dominican Order after university. His parents travelled from Trinidad for the ceremony. Other members of his family live in France, in Canada and in the West Indies. Both men joined the Order in 2012, making their profession of solemn vows (lifelong commitment) in 2017. Bishop Denis Nulty ordaining new deacons Brother Matthew Farrell (r) and Brother Jesse Maingot (l) at St Saviour’s Church, Dublin. Pic courtesy of Irish Dominicans. Brother Matthew and Brother Jesse will continue their studies in theology as part of the journey towards being ordained priests in the summer of 2019. The Irish Dominicans have had a remarkable number of vocations in recent years, including the ordination of eight priests in 2016. Elsewhere in his homily, Dr Nulty alluded to the current debate over the issue of women and their role in our Church. “Matthew’s Gospel assures us that without the women there would be no narrative around the Resurrection and this is fundamental to our faith. It is left to Mary of Magdala and the other Mary who become the first apostles to the unbelieving disciples,” the Bishop of Kildare & Leighlin said. New Dominican deacons Brother Matthew Farrell and Brother Jesse Maingot at St Saviour’s Church, Dublin. Pic courtesy of Irish Dominicans. The Bishop stressed that Brother Matthew and Brother Jesse are not being ordained into a ‘Men’s Club’, “they are being ordained into Church which is full of the Easter promise that Christ lives, despite the darkness that prevails in today’s society”. He revealed that since he was appointed a bishop in 2013, he has celebrated three priestly ordinations and ten diaconate ordinations. At a time of a scarcity of vocations and ordinations, “we need more than ever to invite students perhaps in our third level institutions, we need to be brave enough to invite an older cohort to consider ordination”. He complimented the Dominican family for their work in inviting those in third level to consider the priesthood and for nurturing Matthew and Jesse’s vocation journey over the last number of years. While lay involvement and lay participation is critical in terms of the life of our Church in 2018, equally critical is the priesthood, Bishop Nulty said. “The responsibility to lead the promotion of vocations cannot fall on the few, even on the Bishop and the Provincial, it has to be in the minds of every person who practices their faith and who nurtures a love of Church. If we do not have priests, we won’t have the celebration of the Eucharist,” he warned. 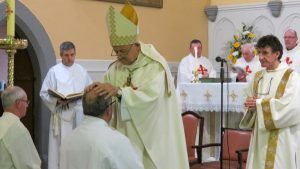 Meanwhile, in the Diocese of Achonry, two ordinations to the permanent diaconate took place in Co Mayo and for which Bishop Brendan Kelly returned to his former diocese to preside at the ceremony. A packed congregation in the Church of St James’, Charlestown, Co Mayo watched and prayed as Martin Lynch (Parish of Kiltimagh) and Kevin Flynn (Parish of Collooney) became the first Permanent Deacons in Achonry. Both men are married and their families were in attendance along with many friends and well-wishers.